The 26th International Conference on Artificial Neural Networks. Conference proceedings are published by Springer in Lecture Notes in Computer Science, vol. 10613 and vol. 10614. Deadline: May 15th, 2018: ICANN 2017 authors are encouraged to consider the Call for Papers for the Virtual Special Issue on “Machine Learning and Bio-inspired Computation aid to Inform Complex Environmental Decisions” open in the Ecological Informatics journal. Deadline: 31 December 2017: Call for Papers for the Special Issue for selected ICANN 2017 Papers is now open in the journal Entropy. Deadline: 20 November 2017: ICANN 2017 have been contacted to raise attention on the Call for Papers for the Special Issue on “Graphonomics for e-citizens: e-health, e-society, e-education” open in the journal Pattern Recognition Letters. ICANN 2017 submitters should mention their status as ICANN 2017 delegates in the cover letter. 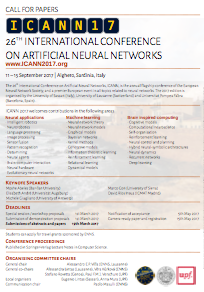 ICANN 2017 will feature two main tracks: Brain inspired computing and Machine learning research, with strong cross-disciplinary interactions and applications. All research fields dealing with Neural Networks will be present at the Conference with emphasis on “Neural Coding”, “Decision Making” and “Unsupervised Learning”.